Owing to our industrial expertise accumulated over time, we have established ourselves as a leading Manufacturer, Exporter & Supplier in the industry. 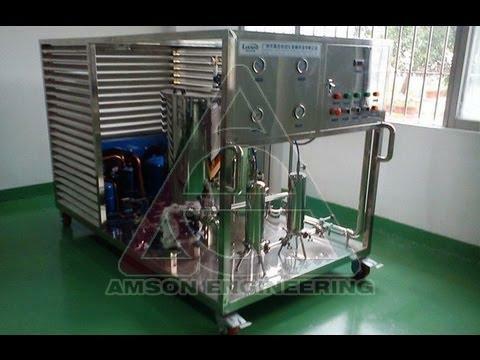 We offer Perfume Mixing Machine to our esteemed customers at attractive price. The machine boasts striking features such as light weight, strong built and durability. Our excellent distribution system enables you to get it delivered to your doorstep in no time at affordable prices. Perfume Mixing unit with 120 liter capacity is made from stainless steel 304 quality, since mixing blade always comes in contact with the perfume material. There is bearing housing and coupling given to hold the blade unit, motor assembly, and centre drive shaft. A 1 HP 3 phase motor connected directly to the mixing shaft is mounted vertically downwards to mix the material inside the vessel. The strong blades are designed in such a way that the internal material is homogenised properly in less time. Also, a variable Speed drive with a separate Panel box is provided with each unit to control the speed during mixing operation. A speed of 0-1500 Rotations per minute can be achieved by this machine. Machine weight - 55 kgs. Mixing capacity - 120 liters. Mounting; Flange and bracket provided to mount on 100 liter vessel. Height adjustable blade - 1 no. and 1 blade fixed at end. Mixing shaft length - 850mm. Flame proof motor provided on request for perfume type liquids. Separate Control Panel provided with unit. Motor capacity; 1 HP, 3 phase. Mixing time - 5-10 minutes.